Posts | Murder & white-collar crime in corporate India | Crime and deception in not new to corporate India. The scale is. It’s a rum thing, being a writer. You never know why strangers smile at you. Especially immediately after they discover that you write fiction. What with the world and his uncle starting to write, and with no dearth of “publishers” willing to print your stuff, all hues of writing – the good, the bad and the ugly – have flooded bookstores in copious quantities. There are no quality filters. And so, there are writers and writers and writers. No wonder some folks scoff at you. The result? You never know how people will react when they learn that you too write fiction. Will you be appreciated, patronized or ridiculed? It has become an occupational hazard of sorts. Unless you are a best-selling name, of course. In which case, they know that you write poorly or write well. For the rest of us, the mystery comes alive each time you meet a stranger and your brother-in-law proudly introduces you as a writer. ‘You write?’ titters a new acquaintance at a wedding for want of anything better to say. ‘Mythology or romance?’ The two genres seem to account for her entire world of books. ‘Oh!’ She loses interest and starts looking around with an expression that suggests that she doesn’t want to hang around someone who is involved with crime. I make the right noises. I know where this is heading. His wife has drifted away. I try to do likewise, but I am pinned between a wall and the man’s ample tummy. I try to tell him that I am a writer, not an editor. That I don’t steal stories. That I don’t write titillating stuff. But he is insistent. A shrewd look comes into his eye as he tries to strike a deal. I somehow wriggle my way out of it. I mumble that gangsters and vamps are not my line. Nor is gore or titillation. I write cleaner stuff, I say with a touch of righteousness – white-collar crime. ‘Financial fraud and that sort of thing?’ he asks. I nod, eyeing the gap that is opening up between the man and the wall. I might just be able to escape through it. I smile noncommittedly. My attention is on the widening gap. It’s almost large enough for me to slip through. I bolt through the gap. Escape at last! I walk around the wedding hall to get away from him, and eventually find a lone chair for a bit of peace and quiet. But that’s not to be. A stranger pulls up a chair and plonks down beside me. Clearly, being a writer is no unmixed blessing. For those who take up fiction-writing after toiling for decades in the corporate sector, the peril takes yet another form. Some former colleagues – senior blokes who run companies and stuff – start looking down upon you. ‘Et tu, Brute?’ their silent glances seem to ask as they gaze down their Roman hawk-noses. The look they favour you with isn’t unlike what Caesar might have given Brutus in his final hour. I sense what’s going through their minds. Having said this, I must admit that it’s not all peril. There is an occasional perk too; especially since I have begun writing about white-collar crime in corporate India. My ‘corporate thrillers’ (as they are now known) lend me a measure of respectability in corporate circles. And they provide a neutral topic to break the ice with – ‘they are so prescient!’ some say. Even in boardrooms, folks make the time to utter a word or two of appreciation. That’s so welcome after having to flee from lectures on emails from Nigeria! You also get an occasional call or a message from a CEO or an MD, who has become your friend. The latest one was after the recent sting on media houses by Cobrapost. My latest novel, Conspirator, is about paid media and fake news. It tells the story of how a media house monetizes its influence over readers and viewers. Well, I guess there are some perks too! But I must learn to take the perils with the perks. And to take it on the chin from time to time. Speaking for myself, I seldom say that I write, and I discourage my relatives from introducing me as a writer. If people discover it by themselves and want to talk, I’m happy to reciprocate. Otherwise, why open the Pandora’s Box? Let me state at the outset that I believe the current uproar about Facebook (FB) and Cambridge Analytica (CA) is justified. Whether it leads to anything substantial or not, a public conversation about how private data is harvested and used was long overdue. Of course, a key reason it has garnered so much attention is that it was a US election that was allegedly meddled with. Many other elections may have been manipulated in the past as this article suggests, but little notice has been taken of the matter. As long as there is money to be made by influencing individual choices, people will try to shape those choices, both overtly and covertly. FB and CA are just recent instances. It may well have been some other firm. Even if these two firms are “dealt with”, the future will see more firms misusing our private data. To that extent, FB and CA are almost incidental. As long as there are ways to pry into our lives and manipulate us, people will attempt to do so. Consequently, it is up to us voters and consumers to guard against it, and not take the easy option of assigning the entire blame to FB or CA. Yes, there is an urgent need for an entirely new set of standards around how private information is harvested and used. And hopefully, we will see something on that very soon. Meanwhile, as a private individual, I have little or no ability to influence what Facebook, Google and their like do with my data. Nor can I meaningfully influence what our lawmakers will come up with. My only way forward is to look inward and reassess my own response. And be less gullible. Influencing voters is not new. It has been happening for as long as politics has been around. Be it strident TV anchors drowning our views with their clamour, or wily columnists putting out polished pieces that appear balanced and objective, or whisper-campaigners insidiously biasing us, manipulating our choices has been an established occupation for a long time. The issue under discussion is just the next chapter in the same sordid drama. Stripped of jargon and technology, isn’t CA also doing the same old thing? They too tried to influence voters, just as some in the established media have been doing. Some have even gone to the extent of setting up fake think-tanks and trying to manipulate Wikipedia’s content to boost one person’s reputation and tarnish another’s. This is in addition to “placing” articles and op-ed in the traditional press. Thus, what we are seeing in the social media now, is nothing new. FB and CA are mere actors in the latest episode of an ongoing saga (check out this and this article). Are such machinations the preserve of any one part of the political spectrum? I think not. Some employ crude methods because they know no better. Others take a nuanced and a less obvious approach, wherein they appear erudite and independent (and therefore more credible). And a few even resort to planting crass posts that have ostensibly been authored by their opponents. At the end of the day, we, the voters and consumers, are the victims of it all. This flood of duplicity will take newer forms as time goes by. Our best defence would be to develop the ability to see through such manipulations and to erect mental defences. The first step is to become sceptical – even cynical – about anything I receive on social media or through the traditional media. I must not accept something just because it is neatly typed out and formatted. Nor should I blindly accept opinions without first understanding the writer’s and/or the publisher’s predispositions. Among the most virulent of campaigns are the ones executed on messaging platforms such as WhatsApp, where there is no practical way of tracing back malicious posts to their sources. Anonymity, we have seen, spawns irresponsibility. Unfortunately, many of us knowingly abet this malice. We don’t think twice before forwarding (and thereby propagating) venomous messages that resonate in our own echo chambers. Sometimes, our conscience troubles us just enough for us to add “forwarded as received” to the message, and we hold ourselves absolved. This deception is not the preserve of politics. A WhatsApp message has been circulating over the past year about a certain breakfast cereal brand. The message tries to malign the brand by suggesting that the manufacturer uses pork and beef gelatine in its products. Who authored such a message, is anyone’s guess. But the person who stands to gain the most would be a competitor. In summary, this is not just about FB or CA – they are mere examples. The issue is much larger. Trust is rapidly becoming a scarce commodity in this hyper-connected world of ours. Publishers, platforms and content creators are adapting to this changed reality (and opportunity). So should we, as voters and consumers. In this endeavour, scepticism would probably be our best ally. Composed by a reader and a well-wisher in verse form! Will all be unravelled as Inspector Ranade disposed? Try solving this locked room mystery, it’s fun! As cash crunches strike e-tailers, valuations plummet and down-rounds loom large, the stark reality facing e-commerce unicorns become clear for all to see. Protestations that all is well, and attempts to talk up valuations become less credible by the day. As boardroom conflicts escalate and the day of reckoning fast approaches, a shake-out in the sector becomes imminent. The e-commerce sector becomes a pressure cooker. Against this backdrop, take a hypothetical e-tailer unicorn that is facing a cash crunch. What if the e-tailer suddenly discovers bugs in its offices and finds that it is the target of corporate espionage? To make matters worse, an investor disappears and a massive data theft follows. The all-important funding round stalls. As the stakes escalate and risk surges inexorably, murder follows. This is the fictional tale narrated in SABOTEUR, the latest corporate thriller set in Bangalore. As bots mimic humans in the Indian cyberspace, men risk millions in Hong Kong. A story of a wounded unicorn and its venture fund investors. Insider trading, I’ve often thought, must be one of the easiest white-collar crimes to pull off. Even easier than procurement fraud, which must be one of the most pervasive. Someone in the accounts department of a listed company tells his friend or relative: ‘We’ve done better than expected this quarter. We’ll beat market expectations.’ The friend promptly buys a hundred shares of the company. And when the results come out and the share price surges, the friend is a few thousand rupees richer. Now, how do prosecutors even begin to establish that price-sensitive information was used to profit from the trade? Unless, of course, the insider was foolish enough to put his tip on an email or a text message. Not only is insider trading easy to pull off (at least on a small scale), it is also horrendously difficult to prove. There are tens of thousands of people in listed companies who possess such price-sensitive information from time to time. It’s not just the blokes in the accounts department, but also others too – both employees and outsiders (auditors, consultants, I-Bankers, advisors, etc.). During my tenure at the Big Four audit/consulting firms, this was something we had to constantly look out for. The law explicitly prevents auditors and consultants from divulging such information – inadvertently or otherwise – to any party who may benefit from it. And we were prohibited from owning stocks of companies we audited or advised. Independence/propriety is indeed a big deal at these firms. Be that as it may, many do believe that insider trading is prevalent in India. On a small scale, at least. A couple of years back, I was wondering how insider trading could be ‘institutionalized’ (by a hypothetical Indian Prof. Moriarty, if you will) and scaled up. I sat down and ‘designed’ a suitable mechanism. To my delight, I found the scheme eminently workable, and reasonably watertight. And more importantly, it could be implemented with simple technology that is widely available. I then put on another hat (that of an investigator or SEBI), and began looking at how one would go about discovering and unraveling the insider trading scheme once it was implemented. Clearly, that would require sifting through tons of stock market data, and possibly the use of analytics. Once I had both ends of the scheme figured out, I built a murder mystery around it. That became Insider, the novel that Hachette has just released. If you do get to read it, please drop me a note. I’d like to hear what you think of the workability of the little scheme. The Reserve Bank Governor is spot on when he says that Indian banking is in the midst of a revolution. The Unified Payment Interface (UPI) launched yesterday is nothing short of revolutionary. Mobile banking so far has been about doing a few things with your bank account using your mobile phone. It is largely restricted to the bank in which you have your account. UPI now takes it to a new level – it cuts across banks. You can now have a single identifier that can be used across all banks. The positives are many, as can be gleaned from today’s business newspapers. It can potentially replace digital wallets that impose boundaries on where you can use them. Paytm, for instance, can be used to pay for Uber rides, but not Ola. UPI, once rolled out, will enable you to make mobile-based payments for virtually anything. But along with this unprecedented convenience comes unprecedented responsibility. Until a few years ago, your physical signature was your identifier. The advantage was that it couldn’t be ‘stolen’ from you. Yes, a forger could duplicate your signature, but that called for uncommon forging skills. Unfortunately in the digital era, your digital signature can be stolen and replicated if you happen to be careless. And money can vanish in seconds. Access to our mobile numbers and emails are rapidly taking on a central role in our digital ids, for that is what financial institutions use to validate our identities. Be careless about these, and you will leave yourself open to unprecedented levels of fraud. One would do well to understand the risks that come with UPI, as there are any number of ways to steal your digital identity. Make sure that you know your way about before jumping headlong into UPI. For much of the 40-odd years that I have been devouring fiction, the imaginary worlds I journeyed to have been divorced from the real world I lived in. Be it the nineteenth century London of Conan Doyle and Edgar Wallace, or the mid-twentieth century England of Agatha Christie and Enid Blyton, or Perry Mason’s California, they were all a far cry from the Indian city life I was immersed in. What were moors and mews that Christie and Doyle revelled in? What were these mouth-watering scones and tarts that peppered Enid Blyton’s pages? I had never seen a scone in my middle-class life of the seventies. Nothing I read seemed to have much in common with the real world around me. While they were not as alien as Tolkien’s Middle Earth or Asimov’s Trantor, they were nonetheless unfamiliar. Why didn’t we have fiction from our own world, I wondered. Was that why RK Narayan appealed to so many of us? Apart from the undeniable craft he possessed, one could relate to his characters and locales. They seemed real; they felt as if they were from our world. Admittedly, what we read was limited by what local libraries stocked and Sunday second-hand book shops offered. When I gave up studenthood to enter the corporate world, another question popped into my head. Why was so little fiction set where I spent the largest chunk of my waking hours? Why did so few authors write about the corporate world? Surely, there was no shortage of conflict and emotion in the workplace? And the stakes were high too; far higher than in private lives. Talk about motive for crime, and there was ambition, collusion, malfeasance, corruption, love, lust, frustration – you name it! Yet, there was very little ‘corporate crime fiction’. Wouldn’t it be great to have good crime fiction set in India? Well-crafted plots that we can relate to; familiar victims we can empathise with; recognisable antagonists we can heartily hate? With more Indians turning to writing, will we see a surge of crime fiction set in India? Above all, wouldn’t it be great to read gripping narratives written by Indian hands for Indian eyes? Then, the penny dropped. While I waited for others to do it, why not take a shot at it myself? I had already made a beginning with writing epic fantasy, and I had loads of material from my three decades in the corporate world. I had seen ambition and greed at close quarters, and had witnessed sharp minds cross the thin line that separated the two. Opportunities for crime were aplenty, with many readymade for crime fiction. I did take a shot at it, and the attempt became Fraudster. I am happy that one of the Big Five global publishing houses decided to back the novel. Fraudster is about greed and temptation in banking, which is a very thin sliver of larger corporate India. There is space for a lot more stories; tons of them. I hope better writers than I turn to it too. This blog was originally published as a guest post at Printasia. A question I frequently get asked is whether I had any specific purpose behind writing Fraudster. Was I irked by the atmosphere in corporate India, one newspaper journalist asked. Did I want to expose their wrongdoings, another interviewer wanted to know. The answer is an unequivocal ‘No’. I’ve had lots of fun during my three decades in the corporate world, and some of my best experiences have been there. Not to mention some of the brightest minds and the finest human beings I met, and the many friends I made there. Far from being irked, I am thankful to the corporate world for showing me an avenue in which to try my creativity. Why then did I choose to write a novel about some murky realities of the banking world? The fact of the matter is that the corporate world is a fertile ground for stories – inspirational or fictional. It is a melting pot of many types of people; men and women driven by different sets of values, priorities and motivations. Each one has a different worldview, and the environment has far more than fifty shades of grey. It has a fascinating interplay of every emotion one can think of, and every kind of conflict. Fiction, after all, is about emotive conflict. Consequently, the corporate world lends itself wonderfully to crime fiction. The stakes are high too. A person who is worth a million dollars in his private life may be running a 500 million dollar business. A banker who may be worth even less, could be handling a loan portfolio worth billions. A peculiarity of banking is that ordinary men and women handle vast amount of other people’s wealth. Billions upon billions of dollars of it. If a banker falls to temptation and siphons off a small part of the money he oversees, he can gain a lot more than he can hope to gain by any deception in his private life. The potential payoffs for crime, especially white-collar crime, is huge. That, in turn, provides one of the essential ingredients for crime – motive. That’s not all. The corporate world also provides a virtually unlimited supply of the other two key ingredients as well – opportunity and means. With all three main elements covered, it becomes an ideal milieu for crime fiction. But merely setting a murder in a corporate office, or robbing an ATM, does not make it a corporate crime. The nature of the deception and the modus operandi of the crime must have business processes at its heart. It must find or construct credible loopholes in the way businesses are run, and must take advantage of them. To do that, a writer must have spent sufficient time in the corporate world and observed its failings. There must be millions of people who have done that, but yet, we have very little corporate crime fiction in bookstores. Apart from John Grisham, there are very few authors who write good fiction of this variety. I wonder why? The previous post made the case for banks to focus on the proverbial elephant in the room, i.e. fraudulent loans. With loan frauds touching 12% of PSU banks’ net profit, the case cannot be clearer. The stock in a warehouse is pledged for three different loans, and none of the banks knows that the stock is pledged to others. A loan is given to ‘ABC Cables’ for factory renovation, but the factory remains shut. The watchman says that the promoter can be found only at the newly refurbished ‘ABC Bar & Restaurant’. A property worth 20 crores bears a valuation certificate showing its value as 40 crores. An expensive new CNC machine is hypothecated to three different banks, but the machine in reality is a 25-year old fourth-hand wreck. The collateral for a loan is stock, but the actual stock is one-fifth of what it is on paper. And the bank doesn’t have keys to the warehouse. Newly supplied cartons of computers have only stones and thermocol. An auditor certifies the finished goods inventory to be three times the actual inventory. None of these is of the scale of the alleged Syndicate Bank scam, but few of these, if any, would be unfamiliar to seasoned bankers. It is such frauds, along with some sophisticated ones, that have cost the banking sector Rs. 16,690 crores between 2010 and 2013. How did this happen? The problem lies as much within banks as in the wider ecosystem, and the weaknesses are both behavioural in nature and systemic. Basic banking tenets are ignored when operating staff view a bank’s requirements as blind procedures to be followed, or when supervisors pressurise their staff to cut corners. Some are happy to tick the boxes without doing the necessary due diligence. A good part of loan frauds is due to sheer negligence or lack of tools, but another part involves collusion. While frauds are discovered only when repayment default occurs, their causes lie in weaknesses in the earlier stages of the loan process. 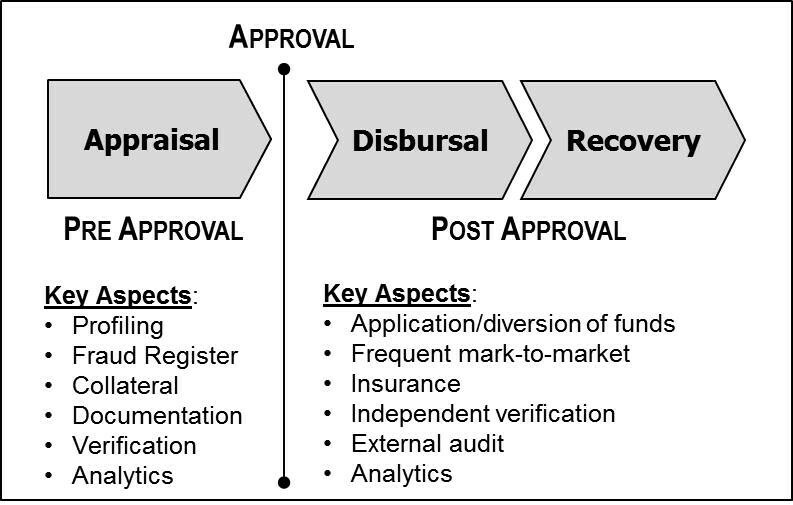 While processes may vary across banks, some key aspects of the loan life cycle are common, and need close attention (see graphic below). The idea is to make bankers at all levels more accountable and less susceptible to pressure from their bosses. The operating level person who gathers information claims innocence, as he was not the person who had approved the fraudulent loan. At the same time, the bank’s management disclaims responsibility, saying that their decisions are only as good as the information they get. Who then, is responsible? Clearly, it must be both. According to Deloitte’s Indian banking fraud survey, the top two reasons for frauds are lack of supervision (73%) and pressure to meet targets (50%). This suggests that the management is as responsible as the staff. Unless both are held accountable, provided appropriate tools, and incentivised, it is difficult to see the situation changing. A bank afflicted by loan frauds must take several steps. Firstly, it must commission a fraud risk assessment of the loan process, which will help identify weak areas and take corrective measures. Next, it must institute a practice of conducting independent external audits on a random sample of loans. These audits must include surprise physical verification of collaterals, and independent validation of documentation and valuations. Third, whenever a fraud occurs, it must trace the histories of colluding employees to identify frauds they may have earlier been perpetrated. And finally, it needs to modify employee appraisal systems to bring frauds into focus, and make fraud management central to a bank’s balance scorecard. This must be supplemented with disciplinary action that includes criminal charges. Even after implementing these steps, the work would only be half done. The other half involves anti-fraud tools. Do bankers have the necessary tools to detect potential loan frauds? How do they profile loan applicants? How do they inquire into a promoter’s past loan history? How do they know that a collateral is not already pledged elsewhere? For this, we must turn to the second set of actions: implementing a centralised anti-fraud mechanism. While RBI has a central fraud monitoring cell, it does not have the necessary tools to prevent frauds. RBI (or some other central agency) must build a centralised system that enables banks to catch potentially fraudulent loans in time by exchanging information on frauds, collaterals, defaults and fraudsters. Just as a shared claims register helps insurance companies fight duplicate claims, a shared facility will help banks prevent sanctioning fraudulent loans. And if one is sanctioned, it can prevent the disbursal of funds. The central anti-fraud system should have details of all frauds, loans, defaults, defaulters, failed companies, promoters, their close associates, collaterals and fraud schemes. But it must be done in a way that doesn’t compromise the privacy of borrowers. A promoter or an employee who hits upon a successful fraud scheme is unlikely to stop with one fraud. A shared facility will help nip it in the bud. Similarly, a valuer who overvalues collaterals can be caught sooner rather than later. Wilful defaulters can be pushed out of the banking system. It is also important to maintain an ‘incident register’ with details of suspicious incidents that are yet to be declared fraudulent. These incidents may be under investigation or under a legal process, but it is critical that other banks are made aware of suspicious activity at the earliest. This incident register must be designed carefully to ensure that privacy and legal rights of customers are not violated. A metadata approach may prove useful in this regard. 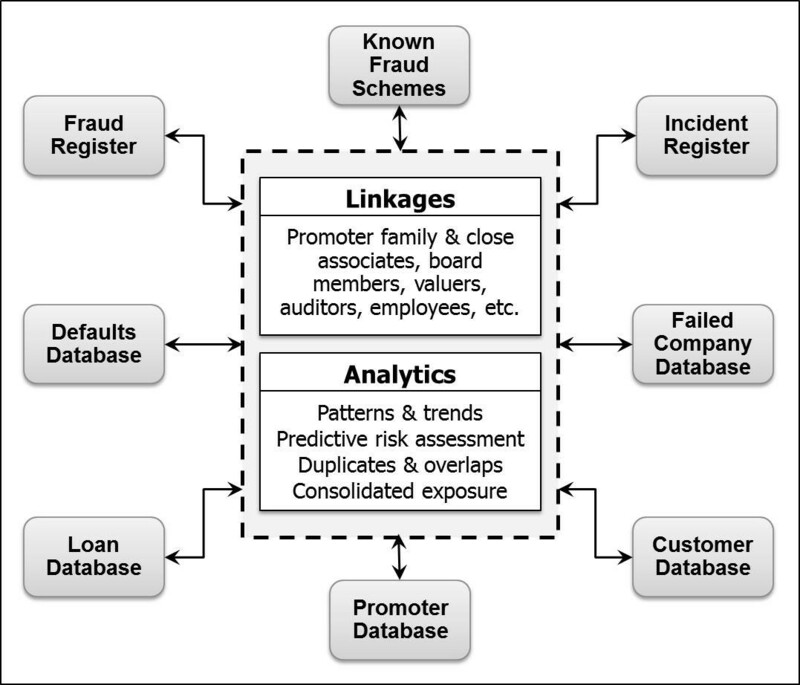 The above graphic outlines the concept of a central anti-fraud system. The system must be adaptive, and should be able to flag high-risk promoters, companies and loan applications, after taking into consideration the linkages mentioned in the graphic. In time, it should be able to take in loan application details and give it a risk rating. Powerful analytic tools are now available, but for them to be effective, they need to be imaginatively combined with an understanding of the fraudster’s methods and the vulnerabilities of our banking systems. Sound design will be key, and the system must have the inbuilt ability to learn on the job. With fraudsters staying a step or two ahead of banks, we will need some sharp minds to participate in this initiative. There will be those who will seek to thwart the initiative, but the time has come for the banking sector to take some serious steps to fight fraudulent loans.